A reader alerts me to an interesting sale. Sunrise (122.002) recently sold in Berlin for roughly 800,000 EUR. 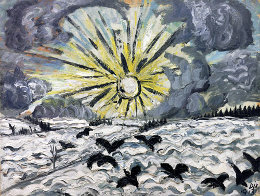 Dix painted Sunrise in the late winter of 1913. The work was completed soon after a major Van Gogh exhibition in Dresden. As you can tell from just a cursory glance, it owes much to the influence of the Dutch master. In 1920 as his star was rising, Dix donated Sunrise to the Dresden city museum. There it would have remained if not for a historic turn of events. In 1933, the NSDAP rose to power. Shortly thereafter, Dix was branded a degenerate and his work was removed from government museums. In 1937, Sunrise was included in the Degenerate Art exhibition in Munich. And here’s where the story gets interesting. Bernhard Boehmer was a Mecklenberg art dealer. Thanks to his connections with Nazi leadership, Boehmer was able to secure a position of power in the German art world. After the Ministry of Propaganda ordered a seizure of degenerate works, Boehmer used his position to profit from overseas sales of the paintings. While Boehmer made a handsome fortune from German “degenerate art,” he also incorporated many of those pieces into his own personal collection. Sunrise was one of the ones he kept. It was a collection he wouldn’t enjoy for long. With the Red Army closing on Berlin in the spring of 1945, Boehmer and his second wife committed suicide. At the time of his death, countless works of art were left as part of his estate. Those works became the property of his heir, Peter. As social order returned after the collapse of NSDAP in Berlin, Peter Boehmer and his guardian moved to West Germany where they sold Sunrise to a private collector. In November 2012, the painting resurfaced. It was scheduled to be auctioned in lot No. 7 at the Grisebach auction house in Berlin. Its estimated value was around 350,000 EUR. At the last minute it was pulled from the sale and now we know why. Behind the scenes, four German cultural foundations were in intense negotiation with the painting’s current owner. The organizations pooled their resources in order to acquire the painting. The final price was 793,000 EUR, more than twice the pre-sale estimate. But after a long and twisting journey, Sunrise is back where it belongs. On public display at the Städtische Galerie Dresden.